In this third-season episode of the TV sci-fi series Quantum Leap, time-and-space traveller Dr. Sam Beckett (Scott Bakula) "leaps" into the body of one Samuel Beederman. It isn't long before Beckett discovers that Beederman is (a) a manic-depressive, (b) trapped in a dismal mental institution, and ( c ) slated for shock therapy. While undergoing this horrendous experience, Beckett flashes back to the various other personalities he's assumed in previous Quantum Leap episodes. 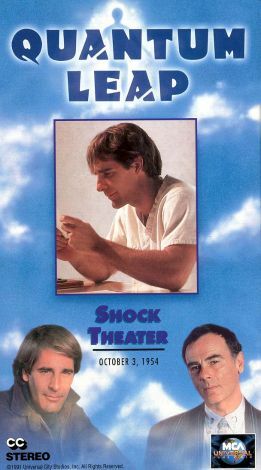 The final episode of the series' 1990-91 season, "Shock Theater", originally telecast May 22, 1991, was designed as a "cliffhanger" to entice viewers to tune in for the fourth-season opener in September. In that episode, we would learn that Beckett's sojourn in Beederman's body would have profound and severe after-effects, not only on Beckett himself, but on his holographic observer Al Calavicci (Dean Stockwell).